The "Health System in Transition" review 2012 launched during the Forum provided an external overview of health sector changes that have taken place in the Republic of Moldova over the last few years. The event was organized by the Ministry of Health with WHO support and brought together over 350 representatives of the Parliament, Prime Minister's office, embassies and missions accredited to the Republic of Moldova, local public authorities, Ministry of Health and subordinated institutions, other key ministries (Labour, Social Protection and Family, Finance, Education, Interior, Environment, Justice, Agriculture and Food Industry), National Health Insurance Company, Medical and Pharmaceutical University, health care providers of different levels, international organizations, nongovernmental organizations and independent local and external experts. 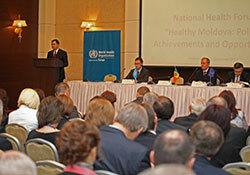 In his welcome speech, the Prime Minister of the Republic of Moldova, Mr Vladimir Filat said, "The population of the Republic of Moldova deserves a modern and efficient health system that is responsive to its needs and I am glad that the Ministry of Health has gathered all relevant partners to evaluate progress in health reforms, but also to identify priorities for the next stage of reforms". The Prime Minster also addressed a series of issues faced by the sector, including informal payments, the need to scale up prevention and promotion activities, access to medicines and improving managerial capacities. Dr Andrei Usatii, Minister of Health stated in his opening speech: "The health sector is currently facing a series of complex challenges and we need an integrated approach in addressing them. The role of other sectors and local public authorities will be crucial in achieving equitable and universal access to health care and public health services". Dr Usatii also expressed his gratitude to WHO, the European Observatory, the European Union and other partners for their continuous support in strengthening the country's health system. "This first National Health Forum is an excellent opportunity to discuss the situation in the health sector and we will focus mainly on three priority topics: health in all policies and cross-sectoral partnerships; health system reform aiming at achieving universal coverage; and the identification of future needs of the system with a focus on addressing noncommunicable diseases (NCDs) and risk factors", said Dr Jarno Habicht, WHO Representative in the Republic of Moldova. "The Forum is important for national authorities but also for international partners and I hope it will give us the possibility to reflect on all major changes that have occurred in the health sector until now and identify a few short-term priority interventions as well as find consensus with specialists from national to local level on how to go forward." In addition to direct financial and organizational support, WHO contributed external expertise to the Forum through the direct participation of two division directors (Dr Hans Kluge and Dr Gauden Galea) and involvement of the European Observatory on Health Systems and Policies in the country level dialogue. Ongoing policy dialogue on health system reforms is incorporated in the biennial collaborative agreement (BCA) 2012–2013 between the Ministry of Health of the Republic of Moldova and WHO/Europe. The event was also part of the WHO and European Union initiative "Supporting policy dialogue on national health policies, strategies and plans".